On the Lookout for Bald Eagles in N.H.
A Photograph by Gerry Coffey on Jan. 12, 2019. A New Hampton hatchery pair by Libby Corbin on Jan. 10, 2019. Seen over Squam River on Jan. 10, 2019 by Jack Dorsey. 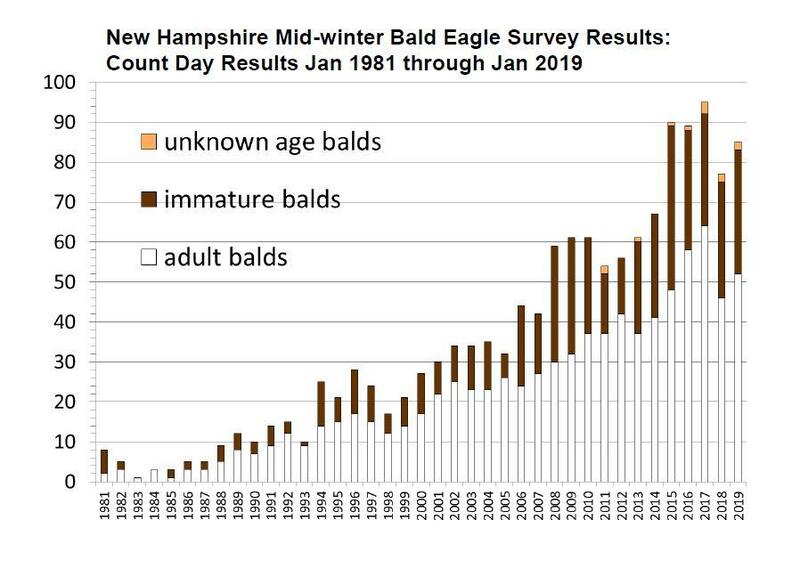 We examine results from New Hampshire's 39th Annual Mid-winter Eagle Population Survey and learn more about these iconic birds, whose numbers in the state have been growing. N.H. Audubon monitors bald eagles as part of an annual contract with the NH Fish and Game Department's Nongame and Endangered Wildlife Program. Bald eagles are now listed as “Special Concern” in the state since their official removal from NH’s Threatened and Endangered Wildlife List in March 2017. And we look at the impact of the eagle's success on another beloved symbol of New Hampshire, the loon. Iain MacLeod - Executive Director, Squam Lakes Science Center. Chris Martin - Senior Biologist, N.H. Audubon and host of Something Wild on NHPR. John Cooley, Jr. - Senior Biologist with the Loon Preservation Committee. Something Wild: Are Golden Eagles Returning To The Granite State? November is a great time to spot golden eagles. They are a rare sight in New Hampshire, but they do pass through the state on their annual migration. Right now they’re on their way south to winter in the central Appalachians. They’ll pass back through the state in March on their way to Labrador and northern Quebec to nest. Golden eagles are sometimes confused with young bald eagles, but there are differences. When bald eagles are in flight, they hold their wings flat like a plank, but golden eagle wings have a slight ‘V’ shape.